7 great things to see and do by the Atlantic Road. The Atlantic Road takes you from lush coastal landscapes and heaths to bare rocks along the exposed Hustadvika, where you can see the sun sink into the horizon. This National Tourist Route has been called the world’s most beautiful drive and has been voted the “Norwegian construction of the century”. 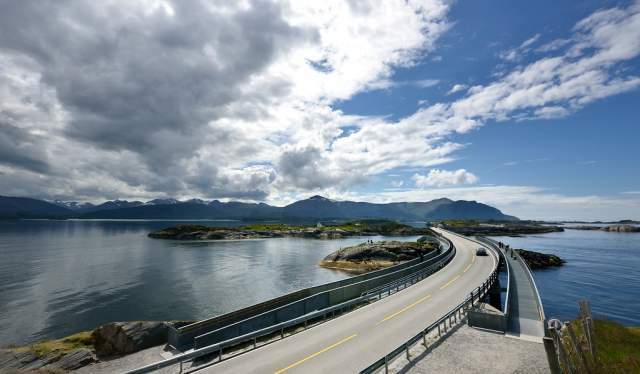 The Atlantic Road connects the island of Averøy with the mainland via a series of small islands and islets spanned by a total of eight bridges over 8,274 meters. The road was opened in 1989 and is toll free. The Atlantic Road has National Tourist Route status, and the entire stretch between Bud and Kristiansund is one continuous experience packed with coastal scenery, culture and history. The contrasts between a trip on a sunny and tranquil summer day compared to a foam-sprayed journey in a storm from the northwest are huge. But whether the ocean is flat calm or cascading over the road, the Atlantic Road experience will give you memories for life. Park your car at designated viewing points and climb a hillock to enjoy the salty air and the scenic view. Storm at the Atlantic Road. The elevated hiking path at Eldhusøya. In 2005, the Atlantic Road was named the Norwegian Construction of the Century. The award was sponsored by the construction industry and the national broadcaster NRK in connection with the 100th anniversary of the dissolution of Norway’s union with Sweden. The road that crosses this “infamous stretch of ocean” was hailed as the world’s best road trip by the British newspaper The Guardian. In 2006, the newspaper ranked the Atlantic Road ahead of more famous roads in for instance Australia and the Himalayas. In 2007, the Norwegian newspaper Aftenposten asked their readers to vote for Norway’s most beautiful car journey amongst eleven selected alternatives. The Atlantic Road came second, only beaten by the iconic tourist destination Trollstigen. Both are located in Møre & Romsdal, so you can easily visit them both on your journey to the Northwest. Also in 2007, Lonely Planet’s travel guide (Blue List) decided to find the perfect place to go after a break-up. “Hustadvika and the Atlantic Road is the best place to go to contemplate how you got dumped. Preferably in the autumn; the view, wind, waves and cries of the gulls are the perfect medicine, whether you are working through grief or recovering from being dumped”, Lonely Planet wrote. In 2010, this impressive road which zigzags across islands and islets was named Norway’s best bicycle trip. Ut.no and NRK had seven finalists, but it was the Atlantic Road that got the most votes. In 2011, the British motoring show Fifth Gear informed its millions of viewers that the Atlantic Road is the world’s best place for car testing. Today, there are hardly any car makes that haven’t used or aren’t currently using the Atlantic Road as a location for filming their adverts. 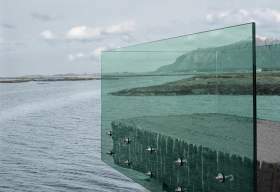 50 million Norwegian kroner went into a new service building and the very special elevated path that bind the sky, the sea and the road together at Eldhusøya island. “Exciting architecture that interprets the atmosphere of this place by the ocean, and emphasises that Norway is a modern country. This and other attractions along the National Tourist Routes will make sure that more people will look to Norway as an attractive holiday destination”, says Grete Kongshaug from the Norwegian Public Roads Administration. The elevated trail takes you over the roof of the service building, which twists along the south side of Eldhusøya. A pattern of specially designed windows decorates the 150-metre-long façade. Inside, you will find toilets, information and a café. The viewing trail is made of metal grates that are built on piles and hover above the ground. No angles are perpendicular or parallel, and the build is really one of a kind. 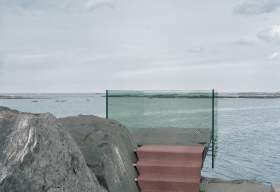 This small, yet cool viewing platform located at the tip of the breakwater gives you a close encounter with the Atlantic Ocean. The untreated, rusty steel gives the viewpoint a distinct structure, and the green glass walls protect you from the ocean spray.